Getting the floor right in facilities employing corrosive chemicals is critical to ensuring the site can maintain a safe, hygienic, and efficient operational environment. However, choosing the optimum flooring solution is a difficult task because demands placed on the floor surface are usually underestimated. Sometimes, the chosen material cannot prevent the destruction of the concrete substrate as a result of chemical abuse. The author has also witnessed many industrial floorcoverings failing within the first few years of service, creating enormous disruption and expense to the client. Poor substrate prep, thermal shock, pH levels, and moisture content in the concrete can cause floor failure. This failure itself can manifest in many forms, with the most common being bubbling, cracking, and delamination. Depending on the scale of failure, this can be confined to a small, easily repairable area or it could affect the entire floor and require the coating to be entirely taken up and reapplied. Understanding the reasons or triggers leading to floor failure can help building professionals prevent such instances from re-occurring. Resin flooring has become a popular choice for sites employing corrosive chemicals due to the system’s hardwearing and easy-to-clean properties. In the most abusive locations, such as secondary containment areas, the flooring would be a type of resin. For places that are a bit less intense (e.g. breweries), resin flooring is often competing with ceramic tiles, and in facilities like hospitals it could be competing against vinyl, linoleum, or rubber. The surest way to avoid resin floor failure is to take the necessary preventive steps at the material specification stage itself by selecting fit-for-purpose, durable floor systems, designed to meet the operational demands of the individual environment alongside any health, safety, hygiene, and compliance regulations specific to the industry. Additional benefits such as bactericidal agents, anti-slip aggregates, and static electricity dissipation can also be incorporated into the finish to meet site-specific needs. These properties can make a working space safer and more effective. For example, antibacterial additives can be incorporated throughout the matrix of a cementitious urethane floor so any contaminants in contact with the surface are being actively eliminated even when the floor is not being washed. Broadcasting aggregates into a resin surface creates a textured finish enhancing traction underfoot. One can also alter the coating’s slip-resistance properties by changing the size and quantity of the aggregate. Dissipating electrostatic charge is usually required in locations with sensitive electronic equipment or inflammable solvents or gases because static charge buildup can pose a dangerous ignition risk. A range of resin flooring solutions, from thin floor sealers to heavy-duty industrial protection in various thicknesses, is available in the market. They can be tailored to suit specific onsite challenges. 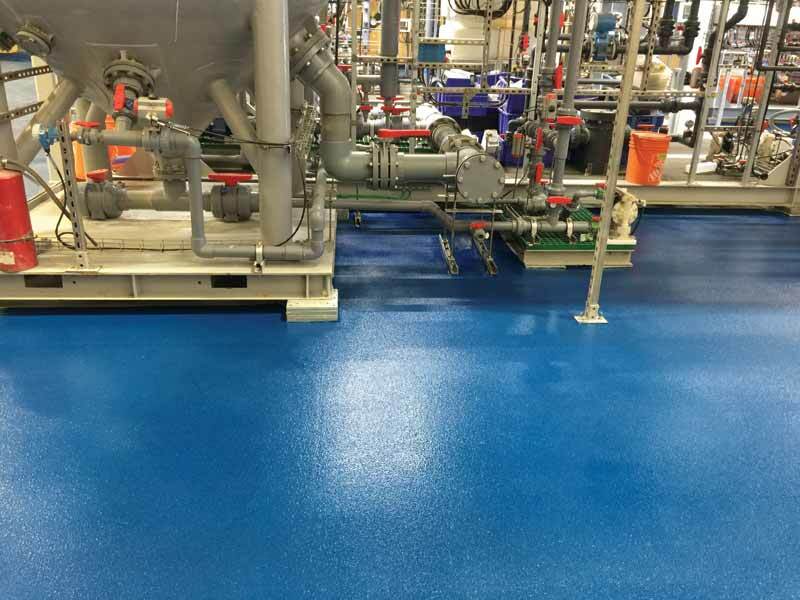 Many different types of chemicals are now employed to manufacture resin floors, but the one common feature is the polymerization or “curing reaction” taking place in situ to produce the final synthetic resin finish. the thickness at which the chemical is applied. The curing is tested by assessing the floor’s moisture level and firmness. Most systems will provide a time window for how long it is likely to cure given the right conditions. The resulting flooring can provide a seamless surface with greatly enhanced performance compared to the concrete base on which it is typically applied. two-part acrylic resin flooring systems (also called methyl methacrylate [MMA] resin flooring). Other specialist chemistries available include vinyl ester, polyaspartic, and novolac resins. There are water- and solvent-based as well as solvent-free types of these synthetic resin flooring materials. All have their own characteristic advantages and disadvantages in both application and performance.